When a developer creates a game that receives a good amount of praise from users and critics alike, it’s bound to get a sequel, right? Much like Call of Duty, Assassin’s Creed has turned into a yearly event where the result is always good, but not necessarily great. Case in point, Assassin’s Creed: Revelations. This was my least favorite of the series and everything went downhill from there. AC III looked promising, but failed to meet my expectations as it took up to eight hours to get it any of the fun and was, at times, quite boring. So now we have Assassin’s Creed IV: Black Flag, obviously riding atop the major success of Assassin’s Creed III’s remarkable naval combat (the best part of the game). Here, there is no waiting for the action, the story is more light-hearted, the gameplay’s been refined to a tee, and it’s miles better Assassin’s Creed III. Assassin’s Creed IV: Black Flag begins with you playing as a crew member named Edward Kenway on a ship under attack by an assassin and his troops. You, unlike your crew members, survive and find yourself stranded on an island along with the assassin. The assassin takes off and you chase him through the jungle. You eventually corner and kill him, take his suit, and the story goes from there. Not long after, you commandeer a ship in which you dub the “Jackdaw”. You spend much of your time at sea attacking ships and exploring islands. Right after the first level (AKA the tutorial), you learn that rather than playing as Edward Kenway directly, you’re assuming the role of an employee at Abstergo Entertainment playing through a simulation of his life. The company’s goal is to make interactive sequences of history and sell them to the public. Every so often in the game, you’ll have a short level where you must exit the Animus and do some other things that really took me out of the experience. Every time I was separated from the pirate world with these first-person areas, I felt like the game was at its low point. It’s not that these dividers between levels are bad, but they break up the flow of the game. Okay, let’s talk gameplay. All of the on-land exploring and combat is the same from previous games. You can free-run to climb up and jump to and from buildings on the several islands available. However, on-land play is only a third of the game, as you’ll spend most of your time at sea. As I said earlier, the naval combat is back from Assassin’s Creed III and is better than ever. You have full control over the vessel and can use several weapons such as, as starboard and port cannons, rear exploding barrels, and the front dual cannonballs. While in battle against another ship, you have the option to either board them and steal their resources or just blow them out of the water and salvage only half of their items. However, you can’t board them immediately. There’s a certain point where the ships’ health bar has been almost fully decreased. At this point, you can board them which is some of the most fun I had in the entire game. It’s immensely rewarding to do this. After you kill the majority of the crew, you have the option to either use the ship’s resources to repair the Jackdaw or send the ship to Kenway’s fleet. There are three speeds for the Jackdaw: normal, high, and Travel Speed. Travel Speed is the fastest form of sailing, but unlike normal and high speeds, Travel breaks you into a full third-person view of your ship. It looks cool, but the controls begin to feel a bit clunky when broken out so far. Also, I know it’s a video game, but the speeds increase a little too quickly in my opinion. This is just a nit-picky thing and to be honest, this way feels better for the game. Where is my bale of hay? There are parts of AC IV that involve swimming which can be fun, but gets old after a while. There’s also the slightly controversial parts of the game where you must harpoon animals, such as sharks. You will get in a small rowboat, chuck spears at a Great White and get dragged around by the thing until you kill it. 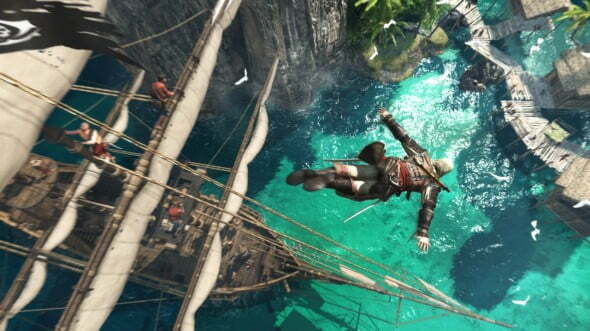 This adds variety to Assassin’s Creed IV, but to some, it’s just wrong. However, I had no problem with it. Graphically, Assassin’s Creed IV is one of the best looking current gen games to date and also shows off the hardware capabilities on PS4. While sprinting through the jungle, you should stop and admire the game’s amazing locales. Even at sea, the graphics and effects are overwhelming. The water ripples realistically and sprays onto your ship. When travelling through a storm at night, the effects are at their best. I was especially impressed by he fact that whales occasionally emerge from the water, some scripted, most random. If there’s one more thing I should mention, it’s mulitplayer. The multiplayer is almost exactly the same as that of AC III’s. There’s the Assassination mode where you must pretend to be an NPC and assassinate your target. Also, there’s a good amount of somewhat unnecessary modes that were probably taken right out of shooters. Let me say that the multiplayer is good, but the developers obviously just stuck with what works. 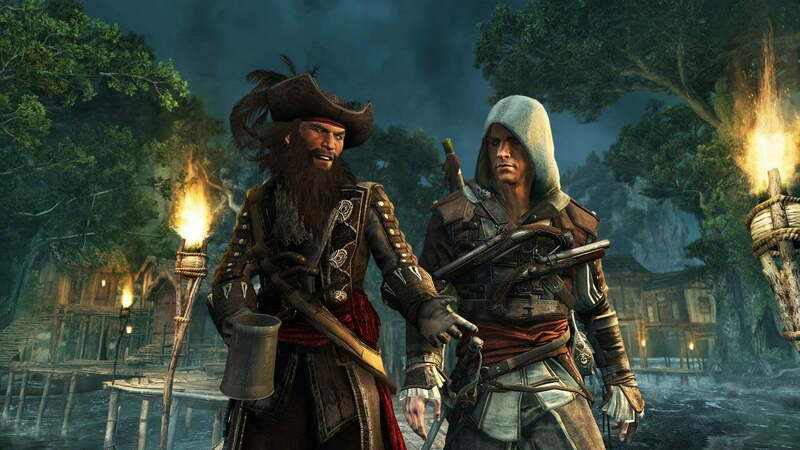 Assassin’s Creed IV: Black Flag is a fantastic sequel to a not-so-fantastic game. This may be the best Assassin’s Creed game since Assassin’s Creed II. It is definitely a change of pace for the series, and I can’t wait to see what’s next.